I was fortunate enough to try the new weekend brunch at Royal Hawaiian in Laguna Beach. One of the best things about the new brunch is that it is served on both Saturday and Sunday. No more waiting until Sunday to have brunch! The brunch, called Kakahiaka, is served from 11:00 AM-4:00 PM and features a variety of island inspired breakfast and lunch fare. We started our meal off with a couple of appetizers. We got the Hawaiian Coconut Shrimp ($13) and the Ahi Tuna Poke ($15). The coconut shrimp was nice and crunchy with plenty of coconut flavor. It wasn't as sweet as some other coconut shrimp that I have had, which I consider to be a good thing. It was very nicely balanced. The Ahi Tuna Poke was very good. The chef has won some awards for this poke. The poke was made with huge fresh chunks of raw ahi tuna, marinated with chile, lime, soy sauce, sesame oil, ginger and chopped macadamia nuts and served with wonton chips. I prefer a little more of a spicy kick, but it was still very good and fresh tasting. For my entree I ordered Loco Moco ($13) and a side of Maui Onion Rings ($7). 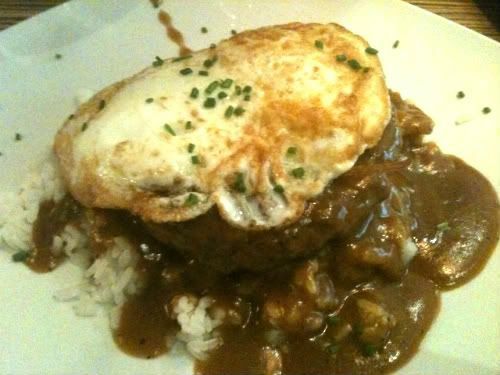 Loco Moco is a popular Hawaiian breakfast dish that consists of a hamburger patty on top of a mound of rice that is covered with a couple of over easy eggs and brown gravy. The elements of this dish are pretty standard wherever you go, but the dish rarely tastes the same from restaurant to restaurant. One of the most, if not the most, important factors for determining a good loco moco is the gravy. The gravy at the Royal Hawaiian had a little bit of a spicy kick to it but was a little light. I prefer a slightly darker, richer and bolder gravy. I still enjoyed the gravy here, I just wished it was a little bolder. The Maui Onion rings were battered and fried perfectly. The crunchy exterior gave way to perfectly cooked, slightly sweet oniony goodness. These onion rings were probably my favorite part of the meal. The onion rings were served with a slightly spicy sriracha aioli. The portion was rather large as well. V ordered the Coconut French Toast ($13) as her entree. It was served with portugese sausage and fruit salad. The portugese sausage was oven-baked which resulted in a nice even crust around each piece of sausage. V really enjoyed her meal. Her only complaint was that the french toast was a little dry. She still thought it was very good though. She thought that the fruit salad that came on top was perfectly balanced and had just the right flavor to complement the french toast. She also said that the Portugese sausage was very yummy. After our meal we were offered a sample sized bread pudding. The bread pudding was made with hawaiian sweet bread. It was dense, but not overly so. It had a nice balanced flavor. V said that it was the second best bread pudding she has ever had. Overall, I would highly recommend the Royal Hawaiian for anyone looking for a Hawaiian style brunch. The prices are reasonable for what you get and the food is pretty tasty. The only thing that would make this brunch better would be if it came with all-you-can-drink champagne. The interior of the restaurant is also a little dim and drabby. This seems to be ok for dinner time, but during brunch it seemed a little depressing. A little extra light and some upbeat Hawaiian music could help a lot in improving the atmosphere. Thanks go out to Jennifer at Ajenda PR for inviting me to the launch of The Royal Hawaiian's weekend brunch! I had the kalua pork scramble. It was real good. OC BBQ Bonanza Starts Today!